Need to throw something in the oven, but don't want to use a large pan? The Chicago Metallic Professional 4-Piece Non-Stick Toaster Oven Set features all the core essentials to create mouthwatering baked goods in less space. This 4-piece set includes a 9.5 by 6.25-inch baking pan, 9.25 by 6-inch cooling rack, 11 by 7-inch roast/cake pan and a 6 cup muffin pan. Made from heavy-weight aluminized steel for superior heat conduction and even baking. Easy release, silicone based, non-stick coating for ease of baking and cleanup. Dishwasher safe for quick and easy clean up. Oven safe to 450°F / 232°C; not intended to be used under the broiler. Sharp-edged utensils and knives should not be used. Ideal size for toaster and countertop ovens: this bakeware set includes all the essential pans to create any type of baked goods in a toaster oven; perfect for single servings and Fits in most toasters. 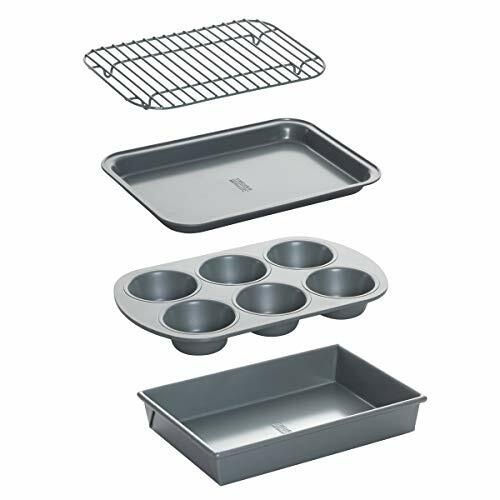 Set includes everything you need: This two-piece set includes a 9.5 by 6.25-Inch baking pan, 9.25 by 6-inch cooling rack, 10 by 7-Inch roast/cake pan and an 11.5 by 7.3-Inch, 6-cup muffin pan. Premium quality, durable and long lasting: each baking pan is crafted from heavy-weight carbon steel for superior heat conduction and even baking. Oven safe to 450 degrees Fahrenheit. Non-stick coating for easy release: easy release, silicone based, non-stick coating for ease of baking and cleanup and is heat safe up to 450 degrees F (232 degrees C).